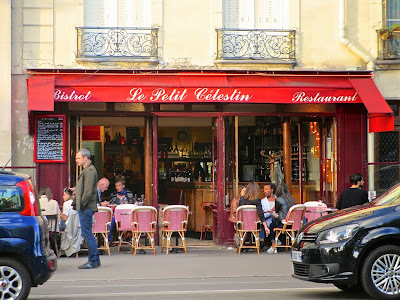 Last week I went to Le Petit Célestin, a tiny bistro on the Quai des Célestins, opposite the Île Saint-Louis, for a second visit, with my friends E and F. We had an excellent meal consisting of classic French cuisine, which is the focus at this unpretentious restaurant. E started with oeufs en cocotte, F with langoustines mayonnaise épicé (crayfish with homemade spicy mayonnaise and I with remoulade de chair de tourteaux aux pommes vertes (crabmeat mayonnaise with diced apples.) The eggs were excellent, as were the langoustines, which were served with a small green salad. My crabmeat was good but not great: too mayonnaise-y for my taste. For mains, we all took the day's special, aile de raie (skate wing). A huge portion of perfectly cooked skate, with classic butter and caper sauce, served over a bed of roughly mashed potatoes. The best rendition of skate that I have ever experienced. For dessert, we continued with the classics, an île flottante and a lemon meringue tart, both fine examples of these ancient dishes, which are not so easy to find these day. Our third dessert was a chocolate cake that was good but sounded better than it turned out to be. Our new neighborhood, in the part of the Marais just north of the Seine (aka the "bas Marais"), has a number of small bistros, and we are slowly getting to know them. Just three minutes from our apartment, Le Petit Célestin is a keeper. This place is small but popular. If you plan to go, make a reservation. Le Petit Célestin, 12 Quai des Célestins (Métro Sully-Morland).